Once again we ventured out here in Afton Wyoming. Coffee in tow… A truly magical place! Around ever bend is another surprise by Mother Earth. This brief vignette is a moment in time experiencing the wonder of Janee Falls. A magical little spot on the road up what locals call Swift Creek. As an added treat imagine sitting in this spot and playing your Native American style flute as you meditate you troubles away. Flute music is played and composed by Brock Jennings… a little song he calls “CHAKRA”… enjoy. This morning Peyton and I decided to head up what is known as Swift Creek. This beautiful creek (river for those of you in Arizona…LOL) cuts through a limestone canyon that eventually opens up into the town of Afton, Wyoming. I will be posting quite a few videos of this beautiful canyon and the creek that runs through it. The scenery is stunning and offers so many opportunities for the photographer to capture. This little spot is at the base of a large rock outcropping where the crystal clear creek meets the rock and then meanders around it to further its journey toward the valley floor. Such a peaceful spot! This same creek is also the path that you follow to discover the world-famous Intermittent Spring that hides up this canyon 4-5 miles in. The Intermittent Spring or Periodic Spring as some call it, is one of but maybe two in the world Cold Water Geysers that cascades out of the bottom of some spectacular cliffs. In the fall and through the winter it ebbs and flows starting and stopping every 18-20 minutes or so. Hiking up to the end of the box canyon is exhilarating and so beautiful. When you get to the end of the climb take a moment to receive Mother Natures reward… fill your bottle up with some of the best water on the planet. Recent reports say the water exiting the bottom of the cliff is more than 2,000 years old. I will save this journey for future post. I really have enjoyed writing my Morning Coffee posts over the years and will continue to do so. I love sharing our little Wyoming adventures we take from time to time. I want to add something new to the mix now. Often when I travel around the Yellowstone Basin with a cup of joe in my hands I will stop and enjoy moments of time at different places that reach out and speak to me. I love visiting the rivers and streams in our area as I find that the sound of the moving water helps calm my spirit. Not to mention the eye candy that surrounds me daily. Morning Coffee Meditation will be 1 minute+ or so snippets of time taken at special locations around Wyoming. Nothing added and nothing taken away. Just one minute+ of recorded time in nature as it exists at that moment. I would like to bring a sense of calm and maybe even a smile to your face from time to time. Afton Wyoming sits at the very south end of Star Valley. If you read the history of the west you will read that Star Valley was considered settled in the 1870’s by Mormon Pioneers. The real history in part is that long before the trails heading west the Shoshone Indians considered this valley part of their sacred hunting and fishing grounds and they had spent their summers here for many generations before. But since the introduction of the American Western Pioneer this valley became home to many Mormon families and they have been part of our community fabric since. Star Valley is over 50 miles long and 14 miles wide at it widest point. Alpine Wyoming makes up the northern border of the valley with Smoot at the southern border just before going over what is called South Pass. Smoot is where the Lander Cutoff (Oregon Trail) emerged and the trail west made it’s way back north through what is now Afton before heading west again towards Fort Hall in Idaho. A year or so ago the Mormons built the first temple here in Afton Wyoming and it sits in a majestic place along Hwy 89. Small by other temple standards it is still a very beautiful place of worship for the Mormon community. I drive by this temple on a daily basis and I have always said I wanted to stop by and snap some pictures. Why not this morning? So we grabbed our hot freshly made coffee, with just the right amount of sugar and cream and headed for the temple. This image at the top is the result of this Morning Coffee for Peyton and I. It is time again to get back to my Morning Coffee posts. One of the most enjoyable things I have done when it comes to blogging is simply sharing one of my daily adventures which starts each morning with a great cup of coffee. For those of you who know me know that last year we moved from Jackson Wyoming to Afton Wyoming in order to obtain horse property for our daughter. Although we now live in the Star Valley area Jackson is a frequent adventure in itself. For those of you who may be new to our blog posts Star Valley is rich in western history. It was for centuries a place with the Native American people who lived within travel distance came to hunt and fish during the summer months. Then in the mid to late 1800’s the area was settled by those heading west. The Oregon Trail in its many facets came right through was is now our back yard. On this morning I decided to adventure not far from my home to an old homestead I pass all the time. Each time I pass by I say to my wife and myself that I need to stop and take a few photographs. Although I really have no idea of the history of this quint yet humble home I just love it’s setting. I wonder by whom and when this home was built. What about the large tree setting next to the this humble cabin? Did the family that built it plant it and if so was it for shade or maybe just aesthetics. Did they have children and if so whatever happened to them? As you can see today it is a much different place. The home is empty and the stories that must have surely been told throughout the years are now secrets of this lonely yet beautiful setting. Wyoming is truly a magical place. Some great adventure abound just about everywhere in the state. Star Valley is rich in Western History some good and some not so good. But on this morning I did stop and take the time to watch the sunrise, enjoy more than one cup of coffee, ponder the past and took some pictures… enjoy. It has been some time since I posted a Morning Coffee post so I hope you like the first one for Spring 2018. Living in Wyoming offers so many opportunities for one with a camera. This mornings journey began around 4:30 am when my alarm went off. I popped out of bed, made some coffee, woke Peyton and got my camera gear together, jumped in the truck and headed south west. This morning’s adventure would take us about 50 miles to the Bear Valley area and just west of Montpelier Idaho. For those of you who grew up in the 70’s you may remember the movie Butch Cassidy and the Sundance Kid with Robert Redford and Paul Newman. This is Butch Cassidy country for sure. Butch Cassidy was known to summer just a few miles from our home here in Star Valley Wyoming but that story is for another post. Montpelier Idaho is not only home to one of the best Oregon Trail museums in the country as this town was a major hub for those heading west it is also home to a bank that was robbed by the infamous Butch Cassidy and his merry band of men. August 13, 1896 was a very bad day for the Montpelier Bank as Butch managed to rustle up more than $16,500 in Gold, Silver and Currency. A good days haul for his criminal band for sure. But this was not my intended destination this day. I was actually heading to the south west end of Bear Lake to a place where an old School house sits that I have wanted to photograph for some time. Not sure when it was built but I have been told it was well before the turn of the century. This school house sits right on one of the main pathways of the Oregon Trail and it seems to be in pretty good shape considering all the long winters that have attempted to rob this place of its soul. Peyton and I arrived, coffee cups empty, and waited for our 10 minute window to get some pictures in the early morning light. I have waited for a morning like this for over 3 weeks as we have had days of clouds, rain and thunderstorms. However this morning was absolutely beautiful. We pulled up to the school house and I did my thing and ten minutes later we were back in the truck heading back home. On the way back through Montpelier I snapped this picture of the Butch Cassidy museum that sits right on main street across from where the bank robbery occurred. If you ever plan a trip to the Yellowstone Basin put Montpelier and the Bear Valley in your travel plans. You won’t be disappointed. Winter has finally passed here in the Yellowstone Basin. I can’t tell you how nice it is to see the ground again… and the sun! I spent a good part of this winter studying some of the latest Nikon Cameras and it was time to step up to something new. I definitely wanted something with a fast frames rate and a camera that operates in lower light as well. Although I was hoping for the release of the new 800 series camera I decided to pull the trigger and purchase the new D500 as I shoot so many moving things up here. This new Nikon camera is just as advertised and once I was able to get it to my front door I could not wait to get out and take some new pictures. The weather however did not cooperate until this past week when I finally got a window of clear weather. Although I was not able to get out as early as I wanted I did make it to one of my favorite spots to look for interesting things to share. This morning I decided to go to the gym first and then head north with my favorite LARGE cup of morning coffee in my hand. I must say – I need to order two cups from now on or take a thermos… One is just never enough. This time of the year the mountains are just starting to come alive. This morning I headed to Antelope Flats just north of Kelly Wyoming. The light was not what I wanted and there was very few animals to be found. One of my favorite animals to photograph is the Pronghorn Antelope. They are hard to get close enough to and they are FAST. This big boy was checking me out and just as I was getting into a position where I would be on the right side of the light some tourists decided to speed down the road I was next to at an unacceptable speed thus forcing me to take these shots while I could. Even though these are not what I wanted I do get excited for this summer as I am sure to encounter my friends again on favorable lighting terms. One of the most enjoyable things I am able to do where I live is to walk out my front door and I can find so many wonderful things to take pictures of. The Yellowstone Basin is truly one of the most beautiful parts of the United States and photographic opportunities are simply everywhere. As I have achieved a higher level of skill for this craft so too has my desire to keep up with the latest camera technology. Today’s DSLRs are simply amazing. The quality of the image taken is almost as real life as viewing it through your own eyes. I have been waiting for some new camera introductions later this year but my older Nikon was crying for help. So I decided to pull the trigger and new camera now and then watch for future releases. I settled on the new D500 which if you look into it is simply amazing at the depth of capabilities built into this new body. With a burst rate of up to 10 FPS (Frames Per Second), 151 focal points, 4000K video and more I can’t wait to try it out in the wild. I am sure I will be sharing some new stuff real soon. I am currently awaiting an order of new Gallery Quality Acrylic Mounts that are being added to this website for sale as I write this. Acrylic Mounting is nothing short of amazing! For several years I wrote a blog post almost daily and I called it “Morning Coffee”. I had so many people tell me how much they enjoyed these post many of which can still be found on this website by clicking on the MENU LINK “BLOG” and then in the search field search “MORNING COFFEE” and a list will render for your reading pleasure. Here in the Yellowstone Basin our winters tend to be long and cold. Most years winter comes and goes within the normal season time frames and yes snow is definitely part of the mix. There are really two seasons that bring people to our area… summer and winter. Not that Fall and Spring are not beautiful but the masses tend to travel during the summer and winter months. Summer is simply breathtaking here in the Yellowstone Basin and people flock to this part of the world during the summer months by the millions. Winter is a different crowd mostly looking for that powder stash we are so well known for. Not only skiers but snow machiners as well. Togwatee pass is one of the top places in the world for Snow Machining and our resort Jackson Hole Mountain Resort is one of the top ski resorts in the world. But for those of us who live here getting away from the deep snow, especially in years like this where the snow just keeps coming is a necessary endeavor. Last thursday we decided it was time to just go … anywhere where the snow was not so deep. 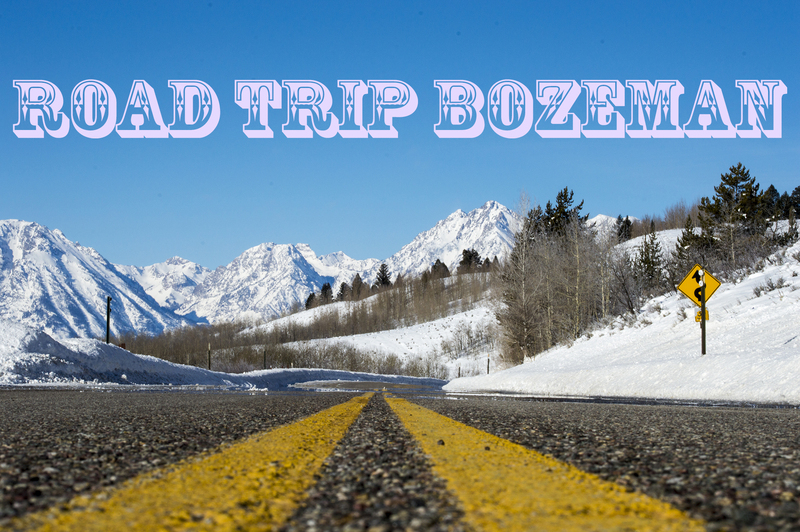 Our destination was to be Bozeman Montana. From our home here just south of Jackson Hole our road trip was to take us 227 miles to the heart of Bozeman Montana. Once in Bozeman we stayed for the night and in addition to our normal Costco run we decided to explore some new places to eat since when in Bozeman this is one of our favorite sports. This trip we ate at four local restaurants two of which we will not talk about but there were two that we really enjoyed. We love to eat breakfast at local eclectic venues if we can find them and one that we ate at was simply a joy. We found and ate at the Stockyard Cafe located in the Northeast side of Bozeman. A bit of an adventure to find and truthfully not a lot to brag about as this place is truly a small slice of Americana. Our first impression was that we made a mistake as this place is actually at the Bozeman Stockyards. We located the little red building that at first glance seemed to be in need of repair. But with all the cars parked in the parking lot it was a good indication that the food inside would be the perfect answer to the morning hungers. To be truthful there is not a lot to talk about as this little cafe is well – let’s just say a place stuck in time. Don’t be surprised if you will need to help the staff with your table and such and the tableware is… well kind of plain. But those people who had already been served all seem to be pleased with their meals as everyone was eating and not much talking going on. We placed our orders for each of us and waited for the hot coffee to pour which basically is a bottomless cup of joe for those of you who love coffee. The servers were friendly and busy to boot. The place was decorated with local flavor and let’s just say the decor was done a few years ago but actually quite quaint. There were three of us for breakfast and I must say that we were not disappointed with our meals. I admit it… I had the biscuits and gravy two eggs and a side of local bacon… Why not? After all this was the west and we were in a real western cafe. Peyton’s meal which was … well I am not real sure – maybe some sort of huevos rancheros but delicious just the same. Brynn had the french toast and she too left satisfied and smiling. If you want a real feel good breakfast then you have to visit the Stockyard Cafe. It was a lot of fun with a great atmosphere and the food and service were excellent. We liked it! The other meal we had which was really good turned out to be the first choice of our daughter Brynn the evening prior. Brynn selected Pizza Compania Italian Restaurant which is located in the Cannery district of Bozeman. This restaurant sits in what was apparently the old granary and the atmosphere is excellent. The funny thing was that earlier in the day we were talking about maybe a pizza place but she was not having the idea. But later that evening she all the sudden got the bug for pizza and well, it was her turn to pick. She did a great job picking Pizza Compania. This restaurant is probably the best place we have eaten in Bozeman. The service was excellent and friendly, the beer cold and local, the food simply amazing. The artichoke dip we started with was absolutely the best we have ever had. OMG – we could not stop eating it! The salads were fresh and the dressing perfect in every way. But the pizza was to die for! Oh and the cost was hard to believe – our total bill for all that we ordered plus 3 beers and a wine was less than $70.00 dollars. If you are in Bozeman you will want to try this place out! If you like pizza then you will not be disappointed. There are other things on their menu as well and I am sure we will be back to try just about everything at some future date. Road trips can be fun and they can be cathartic to your well-being. We love grabbing a cup of coffee and hitting the road. Although most of our Morning Coffee adventures are a bit shorter in duration. At the end of the day and the end of the trip we came home with smiles on our faces.